Health conscious people search the news and the web daily to find out what new, horrible thing has been discovered about a food or food product. In the last ten years, hydrogenated and partially hydrogenated vegetable oils have received much international attention as more people are educating themselves on prevention of heart disease and high cholesterol. Foods prepared with these oils are deemed harmful, and even fast food restaurants are responding to these concerns by placing restrictions on how much hydrogenated or partially hydrogenated oil is used. 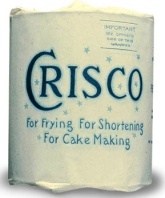 The process of hydrogenating oil was first marketed in 1911 when the company Proctor and Gamble introduced Crisco as a solid shortening that had a much longer shelf life than other oil products. Hydrogenation takes place by adding a hydrogen molecule to vegetable oil, which consists of hydrocarbons in its natural state. The molecule is forced in by applying heat (as much as 400 degrees) where the existing carbon molecules split and the hydrogen bonds to the split atoms from the existing organic material. This process transfers the liquid oil into a solid, making it a “trans fat”. This affects everything about the oil’s properties, changing fats that were once unsaturated (which are helpful to the human body) into saturated fat. This converted fat may last longer on the shelf and is certainly less expensive than traditional oils and fats as well as being very resistant to high heat temperatures – however the health risks far outweigh any benefits it may have. One of the first people to research and publish the facts about how fats and oils affect the body was Dr. Joanna Budwig, creator of the controversial Budwig Anti Cancer Diet in the 1950’s. She maintained that while the body needs essential fatty acids to survive, one must take caution in the amount of fat consumed and in what form. Ideally, these essential fatty acids will work together to create important nutrients for survival, but our bodies need assistance in creating them. Omega-3, Omega-4, and Omega-6 are three EFA’s needed, and can be found in many nutritious foods. Oil rich fish such as salmon and mackerel, olive and flax seed oils, leafy greens (the darker the better), whole grains, eggs and leaner meats are excellent sources of these omega-fatty acids. The saturation from the hydrogenation process continues to heavily load the arteries and the inside of our bodies. Long term use of these fats can cause high blood pressure, cardiovascular disease, diabetes, certain types of cancer, stroke, and other harmful health risks. Saturated fats from animals and animal by-products have often been critiqued (and rightfully so) as being extremely unhealthy, but hydrogenated or partially hydrogenated oils are even worse than these. They not only raise the “bad” LDL (liproprotein, or low density cholesterol) but the HDL (high density lipoprotein, or “good” cholesterol) is actually lowered in this process. 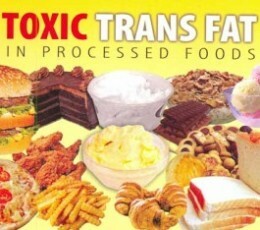 In other words, trans fat is a double whammy, and should be avoided especially in large quantities. After hearing all of this about the hydrogenated oils, the question may be – what about partially hydrogenated oils? Are they any better due to not being a complete process? In actuality, they are worse! There is not only the potential harm from the consumption of these foods, but they end up inhibiting the body’s ability to absorb the fats that are beneficial. They differ only in that partially hydrogenated oils have a thinner base. Polyunsaturated fat is used rather than unsaturated fat. These processes essentially take perfectly good essential fatty acids that our bodies need and make them unhealthy, with the only benefit being economical. It’s bad for the body on every level, but the sales of these foods continue because of their low price, pleasing taste, and longer shelf life. More sales means more profit. Yes… it’s all about the money. Some of the foods that people should severely limit or avoid altogether (unless specified on the label) are as follows: vegetable shortening, stick margarine, many processed frozen foods and dinners, non-dairy whipped toppings, microwave popcorn, pasta and sauce mixes, cake mixes, enriched bread, cocoa mix, french fries, commercial breakfast cereals, instant potatoes, and many others. This is why it is so important to read the nutrition label on foods which are now required to show how much hydrogenated or partially hydrogenated oil is in the product. Anything that says “hydrogenated” should be looked at with caution and when possible, replaced with something that has more nutritional value. The hydrogenated cooking fats and spreads are not as high in hydrogenated fat as stick margarine, but should still be used sparingly. Thanks to efforts by many activist groups who have years of medical research to support their statements, food companies and restaurants are now required by law in many places to reveal their information on what hydrogenated oils are used. Since 2003, Food and Drug Administration regulations dictate that the exact amount of trans fats are shown in the nutrition labels on foods. It can be found directly underneath the “saturated fat” content. The higher those two numbers are, the more the food should be avoided. It should however be noted that the words “0 trans fat” are misleading. The product may still contain more than half a gram of trans fat per serving size. Eating several servings adds to that number, and many people will do this thinking that the food is safer. By law, the food companies are allowed to claim “0 trans fat” if there is one half a gram or under, but activists continue to push for this to be changed. The important thing here to note is that there is no safe “number” or level set for these hydrogenated oils. The wisest choice is to look for alternatives to use a majority of the time. A study done by The New England Journal of Medicine in 2006 surmised that more than 200,000 cases of coronary heart disease could be avoided altogether by replacing these fats with healthier alternatives. Believe it or not, one of these alternatives is butter. Small quantities of butter are actually less hazardous than trans fat even though it is a saturated fat. As long as it isn’t overdone, butter as well as tropical oils such as palm and coconut are viable alternatives. Restaurants have even begun advertising the use of trans fat free cooking. McDonalds as well as Wendy’s and many other commercial fast food places have switched to non-hydrogenated oils such as corn and soy blends, dropping the fat content of the food significantly. Hydrogenated oils stop the body from absorbing the good fats necessary to stay healthy. Because these fats are inhibited, they end up as waste, and the “hungry” feeling remains – therefore, more is consumed. It’s much better to eat a well balanced, healthy diet full of good fats such as nuts, avocado, and olive oil as well as generous helpings of fruits, vegetables, and whole grains. When buying snacks, look for the non-hydrogenated tropical oils on the ingredients, and always be aware that “0” trans fat does not necessarily mean that it is trans fat free. When I was a kid we used a lot of lard. I remember the smell of lard and potatoes frying up on the stove. I also remember when my parents wouldnt even consider buying margarine. It was cow butter in our family and that was often purchased from farmers who made it.